We entered Jerusalem on a tour bus. Having just come from Capernaum to the house of Peter’s Mother-in-Law where Jesus healed the dying woman with nothing more than a loving word and a soft touch. Hosanna! And then to the synagogue where Jesus himself preached on the sabbath. Again, Hosanna! From there to Tabgha where Jesus is said to have turned two fish and five loaves of bread into a feast for five thousand. Hosanna! And from there to the place where Jesus offered his beatitudes, the eloquent assurance to all on the margins that they are at the center of God’s heart. On to Jerusalem. We got there late in the afternoon. The road was lined with protestors. Not an exceptionally unruly crowd, but then they were well chaperoned by a solid contingent of military peacekeepers. The protestors were shouting at the passing vehicles and thrusting their picket signs in the air. The message on the placards, mostly hand written in Hebrew was….loosely translated….Crucify them! They are an abomination! They violate God’s law! Crucify them! 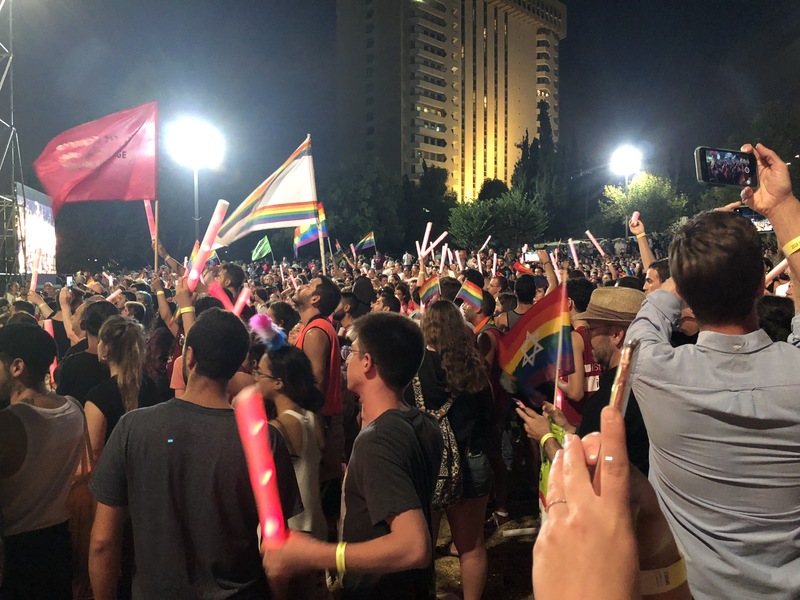 The March for Pride and Tolerance was just getting underway in the center of the ancient city where old and new converge as though time has both stopped and insisted its forward march. This was the local gay pride event that has happened every year since 2002. But it has been an international media event since 2015 when an ultra-Orthodox Jewish man stabbed to death 16- year-old Shira Banki and wounded six others as they peacefully walked for human dignity and the right for every child of God to simply be who they are created to be. 2015 was the second violent occurrence marring this event in Jerusalem. The first was exactly ten years earlier in 2005 when several marchers were also attacked with seething hatred and knives wielded in the name of God. We heard this story as our bus shuffled through the conflicted city streets, increasingly crowded with hordes of humanity – kept in check by a path of police officers in green berets carrying oozies slung over their disconcertingly young shoulders. The Parade was just beginning to gather steam. The entrance to our hotel had been cordoned off by the military. And so the bus parked on a side street and we were shuttled on foot with our luggage past the crowd control barriers into the back door of the Tryp Bat Shevah Hotel. 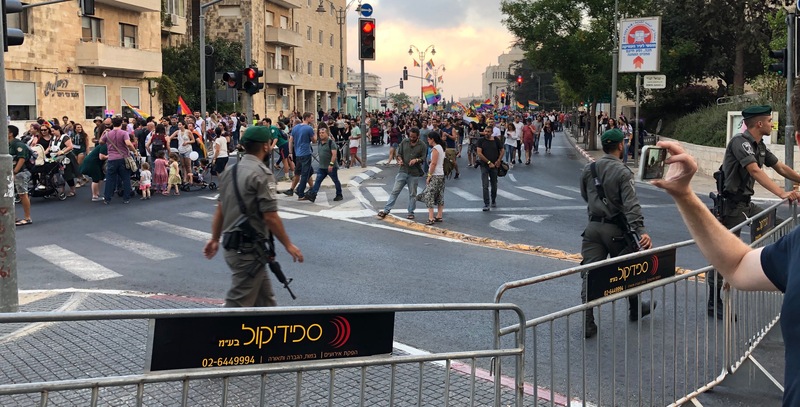 The Jerusalem Post estimated that there were 25,000 marchers and 2,500 military – intent on preventing any more violence and death at the hands of an angry mob. 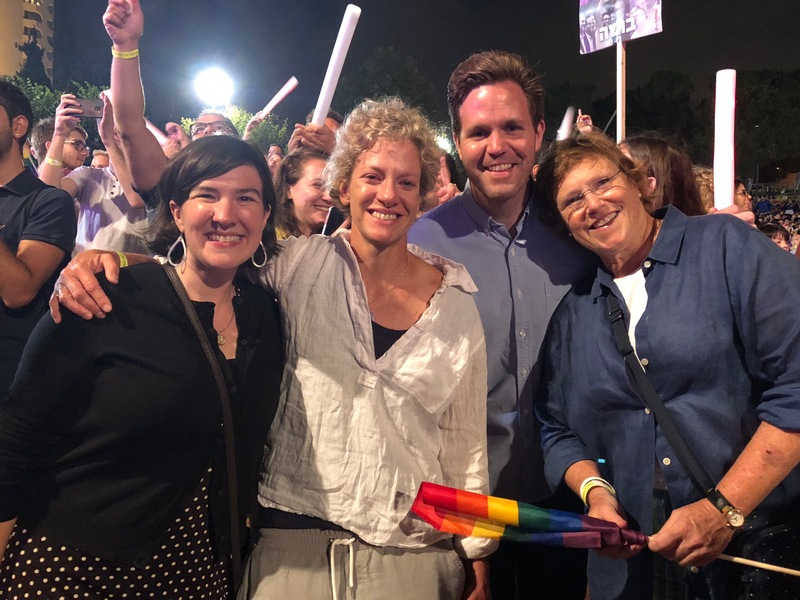 We watched from the lobby of the hotel as thousands of marchers waving pride flags boldly swept through the city – a torrent of human dignity of all ages and abilities and complexions – with the message that love is more powerful than……anything. And that not even the memory of a violent death can stop the truth of love’s power from marching straight down the middle of the main street for all the world to see…..and embrace. Four of our contingent of fifteen clergy, felt the pride of this parade in our own bones. We all felt that we belonged there, if I can speak for all of us. We each expressed our encouragement and hopefulness and our sheer joy. And yet, we could not help but feel the shadow of Palm Sunday in the air. The passionate mob in Jerusalem. It was palpable. After we had checked in to our hotel, the four of us wrenched our way into the crowd and marched side by side with all manner of pride-full people- Jews and Palestinians alike, some wearing t-shirts that said, “God created me this way” and “Love your neighbor as yourself.” An international glob of humanity connected only and forever by our insistence on the validity of love. What a concept! Not separated by land rights or national affiliation or even religious tradition. We were connected, Christians and Jews and Muslims and folks of no religious affiliation at all, by our faith in love alone. And so the story continues. 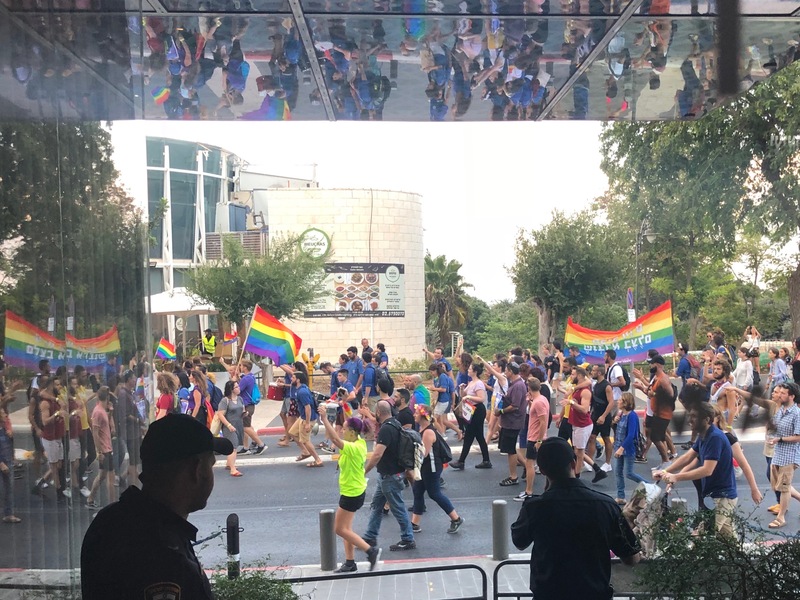 The Pride Parade in Jerusalem as a contemporary splinter from the branch of the story that we celebrate this morning. The story that teaches us that the freedom to love is not even close to free. The fantastically tall tale of Jesus riding into Jerusalem on his own tour bus of a donkey to be met by a thick crowd of folks who first support and adore him and then turn on him so quickly that the celebratory palm fronds are still waving in their hands as they call for his execution. We might think that this story is too far- fetched to believe, were it not for the 2000 years it has been told by millions of good and intelligent people of sound mind and body, as the Gospel truth. But as far-fetched as it may sound, it still feels all too familiar to those of us who are paying attention to the world around us. I think most of us can see and hear and feel ourselves in at least a part of this story that we have heard this morning. We recognize, we re-cognize, literally we re-know this story in our own lives. We re-know this story in the ways that this passion feels like our passion. For me, the Pride parade in Jerusalem. The ways in which we are betrayed and betray each other. The ways in which we are denied and deny each other. The ways in which we are sold and sometimes sell each other down the river or up onto the cross, to protect our own ….well, whatever it is that we fear losing more than we fear losing our own personal power, as the Jewish elite did with Jesus. And too, the ways in which we are tended and tend each other in the hour of need….like the woman who anointed Jesus. The ways in which our crosses are borne, and in which we bear each other’s crosses when the weight is simply too devastatingly heavy to bear ourselves….like Simon of Cyrene. And the way we can count on a few companions to go the distance with us, like the few who can count on us in that same way….as the women who followed Jesus from Galilee and waited for him at the foot of the cross. I dare say each of us has walked in all of these shoes at one time or another. And so it is not hard for us to hear this story as familiar…in our very bones. Each year, we hear the denouement of this story on Good Friday from a different Gospel perspective, a different angle on the broad Gospel message. Mark invites us to relate to Jesus in the deepest suffering of our own being. This is Jesus giving us permission…you and me and all of humanity —in the depth of our own despair, in the dankest recesses of our most unmentionable pain, in the bowels of our darkest moment….to doubt. To feel abandoned. To question where God is in our lives. It is okay to feel for our own suffering. It is okay to wrestle with our own pain. It is okay to question where God is in our despair. Jesus did. Mark’s Passion story is abundantly pastoral – the greatest comfort that can be offered: because no matter how deep our suffering, we can be assured that our God has been there and felt that too. In Mark, Jesus’ final message is very much about his personal suffering. But not in Luke. Luke’s last words on the cross are not pastoral, they are more…..political. And I mean political as in having to do with the realm of public affairs. That is, how we are in relationship to and with each other. As we have been hearing all year, Luke’s Gospel is the divine manual for love in action; how we are meant to treat each other when the rubber meets the road. And Luke’s passion narrative is true to that lens. In the last words from the cross, Luke beckons us not to relate to Jesus’ anguish, but to realize the cold hard fact that the institutions of the day, the state and the religious elite and all of their explicit and complicit supporters have crucified an innocent man. Jesus says to us as he hangs on the cross: Father forgive them for they know not what they do. That is, they are executing a thoroughly innocent life. This is both the ultimate crime of humanity and the cost of a life lived according to love alone. I think Jesus’ innocence is the crux of Luke’s Passion Narrative. In Matthew’s Gospel, after Jesus dies, the centurion says: this man truly was the Son of God. In Luke, after Jesus dies, the centurion says: this man truly was innocent. Even Pilate says that Jesus is innocent. Three times. He says to the crowd, “Why, what evil has he done? I have found in him no ground for the sentence of death.” If nothing else, everyone agrees that Jesus is an innocent man. And yet the crowd demands his demise. It’s easy to pass right over this seemingly obvious detail. It is so front and center that it might be taken for granted. That Jesus was innocent. But I think it is at the heart of what Luke wants us to know about the caliber of love that Jesus has come to share and to demand in his disciples. And so it warrants some deeper consideration. When we think of the innocent Jesus hanging on the cross, it is hard not to think about the families on the border whose only crime is that they seek a better life. It is hard not to think about the hundreds of thousands of captives (mostly men of color ) incarcerated for petty crimes that are grounded more often in their poverty than in their criminal character. It is hard not to think of the children in Columbine and Sandy Hook and Parkland and Compton and Baltimore and Chicago and Dorchester and everywhere where our gun laws and our gun culture, not to mention our often underlying racism, permit the slaughter of children no less innocent than Jesus of Nazareth. And I have not even mentioned the wholesale slaughter of God’s innocent creation. I think Luke calls us to make the connection between the execution of Jesus and the execution of equally innocent life in our own context. Holy Week seems the perfect time to ask whose innocent blood stains our own hands in this world in which we live? Luke’s highlight of Jesus’ innocence is a double-edged sword. In one respect he asks us to check the blood on our own hands. And at the same time, he invites us to check the direction of our own feet. Like Mark, Luke invites us to walk in Jesus’ shoes; to put ourselves in the shoes of our rejected, reviled, ready-to-accept the-cost-of-obedience-to-God rabbi who followed the commandment to love all ways, all the way to the cross. To be ready for the price that our discipleship may well exact. To be ready to be condemned and punished and even crucified without cause, as we say in the corporate vernacular. It’s hard for people of privilege to get our arms around that. The notion that we might suffer without….wrong behavior. People on the margins are much more comfortable accepting that they might suffer without being at fault…..but then people on the margins have much more practice than do we. Who among us here this morning could or would stand for even one minute before the Sanhedrin, with our lives at stake, and not demand that our innocence acquit us. Likewise, who among us could or would tolerate the injustices levied by our own systems of criminal so-called justice and immigration that are standard treatment for people of color and undocumented neighbors? But that is exactly what Luke calls us to do; exactly how Jesus calls us to follow. To love without any thought about the fairness with which we might be treated; without any retaliation whatsoever if and when our love puts us in harm’s way. I wonder how long we would last with our own innocent lives on the line. And I wonder how many innocent lives are on our collective tab, just in the time we have been gathered here this morning? Even if the answer is only one, it is one too many. And we know this because the One whom we remember this morning confirms it for us with the gift of his life. Father forgive them for they have no idea what they are doing. That’s what Jesus said. That was then. But this is now. And now we do know what we are doing. We do know that we are complicit in the destruction of innocent lives. And we do know that someone apparently must be least and last in our temporal world. And so we need to ask the question, why not us? Why must it always be someone else? Someone less innocent than we think ourselves to be. And so as a community of faith, followers of Jesus, we are here to help each other keep that message front and center; to keep it real. To stand for and with each other; for and with all of our neighbors regardless of the cost, regardless of our own perception of our own innocence. Holy Week is a prime time to renew our commitment to God and to each other and to our own hearts. Because in the end, as in the beginning, we are each and all God’s innocent beloved children. May this time between the bookends of Palm and Easter Sunday be our chance to begin again to act accordingly. Now about eight days after these sayings Jesus took with him Peter and John and James, and went up on the mountain to pray. And while he was praying, the appearance of his face changed, and his clothes became dazzling white. Suddenly they saw two men, Moses and Elijah, talking to him. They appeared in glory and were speaking of his departure, which he was about to accomplish at Jerusalem. Now Peter and his companions were weighed down with sleep; but since they had stayed awake, they saw his glory and the two men who stood with him. Just as they were leaving him, Peter said to Jesus, “Master, it is good for us to be here; let us make three dwellings, one for you, one for Moses, and one for Elijah”– not knowing what he said. While he was saying this, a cloud came and overshadowed them; and they were terrified as they entered the cloud. Then from the cloud came a voice that said, “This is my Son, my Chosen; listen to him!” When the voice had spoken, Jesus was found alone. And they kept silent and in those days told no one any of the things they had seen. Finally it is the last Sunday in the season after the Epiphany. We have not had seven Sundays after Epiphany since 2001. It’s been an unusually looooong season. The season after Epiphany is appointed to introduce us to the person and power of Jesus, who will, after Easter become the Christ. It’s the season that begins with Jesus’ Baptism and ends with his Transfiguration. And today, we see for ourselves that Jesus, whose face is transfigured in the presence of prophets who have been dead and gone for generations, is divine. On Wednesday, which will be Ash Wednesday, we will begin the season of Lent with the all too human Jesus. The vulnerable Jesus. The rejected Jesus. The Jesus on his knees on the Mount of Olives. The broken body of Jesus, bleeding and weeping on the cross. The Jesus who is our brother, who shares our flesh, who lives our human suffering. The fully human Jesus. The first distinction in Luke is, quite significantly, that Luke treats the transfiguration not as an experience of supernatural power, but as an experience of prayer. Luke puts us in a very different frame of mind. Jesus and three of his disciples go up on the mountain to pray and while they are praying the transfiguration transpires. They do not ascend the mountain for the purpose of transfiguration. They go in search of prayer. More than in any other Gospel, Jesus prays. And that is one reason why our Lenten theme this year will be Pathways to Prayer. If we are going to be walking through Lent with Luke, we will need to prepare to spend some time on our knees. Over and over and over again Luke emphasizes the power of prayer to mediate the presence of God. Luke wants us to know that divine things happen when prayer is involved. And so after Jesus prays with Peter, John, and James, he is “transfigured” right before their very eyes. His robe changes to a dazzling white. But this is not just a fashion statement. For Jesus’ whole being glows with dazzling divine presence. The author of Luke says that indeed his face changed. And this is the second significant difference in Luke’s story of Jesus’ transfiguration.When Matthew and Mark describe the change in Jesus, they use the Greek verb metamorpheo that literally means that Jesus completely changes form. In Matthew and Mark, Jesus undergoes a metamorphoses, he is literally trans-figured. He becomes something that he was not before. He takes on a whole new identity. But Luke says that only the appearanceof Jesus’ face changed. That is to say, he does not morph into something altogether new. He does not become something that he is not already. Luke does not use the verb metamorpheo. In Luke, this dazzling change is rather the illumination of what is already there. The divinity that has always been there in Jesus, suddenly begins to shine through. This is a significant departure from Matthew and Mark. In Luke, the change is embodied in the way Jesus is perceived, not in the substance of who Jesus is. He was not suddenly divine, he is just suddenly perceptibly divine. It seems more about how the disciple see him than who he is. And so although this passage is called the transfiguration in all three Gospels, I think that Luke’s story would be better referred to as the transcendence. Or maybe, in Luke, Jesus is just plain trans. In Luke, Jesus transcends the boundaries of this earthly existence and becomes more of his true self. For the first time, his appearance matches his inner self, his inner divinity. For the first time, Jesus looks to be both fully human and fully divine, a non-conforming identity if ever there were one! And so Luke tells us that as Jesus prays he is brilliantly and dazzlingly transfigured. Both Moses and Elijah appear with him. The gang is all here. Moses, the keeper of the law; Elijah, the prophet of the Source; and Jesus, the New Creation. A continuity of God’s chosen old and new that is unmistakable. Here they are. And here is where Luke’s version of this story is again a bit different from Matthew and Mark. Right here, the author of Luke clearly makes a connection between Jesus’ mission on this earth and the story of the Exodus in the Hebrew Bible. Jesus is here not just as God’s Son on earth, but specifically to deliver us from the suffering of this world. Luke writes: They appeared in glory and were speaking of Jesus’ departureto Jerusalem….the Greek word used for departure here is literally exodos. Moses, who was chosen by God to lead the first exodos out of the persecution and suffering in Egypt, appears here with Jesus who is God’s chosen one to lead the second and final exodos out of the suffering of this earthly world. As God says to Jesus in this passage, “This is my Son, my chosen”…as opposed to Matthew and Mark, where God calls Jesus the “beloved. Jesus is specifically chosen for this mission. It’s an important divergence. Because for me, Luke elevates this story from a mere revelation, as it is in Matthew and Mark, to a call coined by Australian poet Michael Leunig, a gentle revolution– a focus on Jesus’ particular mission, which is the liberation of those who are marginalized and enslaved, as were the Israelites in Egypt. In Luke, this story of the transfiguration is not just a story of revelation; not just revealing of Jesus’ divinity. In Luke, the transfiguration grounds Jesus’ identity and mission in the story of God’s liberation. What is Peter thinking?! Maybe he’s thinking exactly what we might be thinking were we in his shoes. At least that is what many of the most popular commentaries suggest. The prevailing opinion on this passage says that Peter misses the point of everything by trying to capture and contain what is clearly divine and uncontainable. But I am not convinced of Peter’s apparent…..denseness. What if Peter’s suggestion of building houses for the divine visitors was not a ploy to secure them, but rather an offering of hospitality? What is more hospitable than providing housing for those who have nowhere to go? A sanctuary movement, one might call it. Providing a place where those who have no place to go might regroup before they move on to the next destination. Maybe this offering of Habitat for Divinity has been misunderstood. Maybe it is an offer of sanctuary; a way to offer these divine travelers some sense of belonging. More along the lines of the hospitality of Abraham rather than the selfishness of Jacob. You know I rarely mull a piece of scripture without finding some new insight from my horses. And each year as the transfiguration comes up and Peter proposes his building project to house Moses and Elijah, I cannot help but think about my year living at the stable owned by my friend Carter Heyward on a See-Off Mountain in Brevard, North Carolina. I was just there this week and we talked about this again. It was 2004. I had three horses and Carter had five. It was the start, I think, of this wild weather that has become part of our landscape. And with every storm – and there were several whoppers that year! – Carter and I would angst over what to do with the horses. Should we put them in their stalls? They would be sheltered from the lightning and the rain and the wind, BUT they might be trapped, like if a tree fell on the roof, or lightening hit a gutter and caused an electrical fire. Maybe we should just leave them out in the field. We equivocated every time – knowing full well what we should do. Horses have been surviving violent storms for eons. They are designed with a full compliment of instincts and facilities to provide for themselves on the open range. They have been surviving nature’s wrath for thousands of years, and without any help from me or Carter. And so while we knew that their best bet was to be free out in the field, to have the freedom to navigate around falling objects and windblown….whatever. It always seemed an excruciatingly difficult decision. Lock ‘em up? Or let ‘em go? The decision was so tough partially because human beings would always rather have shelter than freedom. But our real fear about leaving the horses in the fields was that if a tree fell and damaged a fence, they might get away. If the fence was breached, we might lose them. And so the real decision was between keeping them close by putting them in stalls or keeping them safe by allowing them to use their God-given instincts out in the open field. And when I put it that way out loud, it seems like there should not have been any question at all. And yet there always was. In the end we almost always left them out, but it was always an excruciating decision made with great fear and fretting. And so when, in this morning’s reading from Luke, Peter suggests putting Moses and Elijah in a couple of stalls…. I must admit, know how he feels. What if they get away? I know how seductive the prospect that we are the providers, the protectors, the ones who are here to take care of those in our charge. I know how easy it is to forget that horses are designed to be free. They are not designed to be mine, no matter how much hospitality I am willing to offer. And the offer of that freedom is among the pillars of Luke’s story of the transfiguration. It all starts with prayer. Divine things happen when prayer is involved. We are already everything we need to be. We do not need to change into something better, we only need to reveal the image that is already etched on our hearts, and shine that brilliant light through every pore of our being. Our journey with and toward God is about liberation, not security. One could say that in this morning’s reading, Luke is calling us to what my favorite Australia poet/prayer master calls the art of the gentle revolution. A revolution that changes the way we are in this world. That beckons us to trade our performance anxiety for prayer, and to stop longing to be seen as something we are not for the light of God that already shines in us, and to put our faith and trust in the agency of the other rather than our own desire for their security. God help us to change. To change ourselves. To change the world. To know the need for it. To deal with the pain of it. To feel the joy of it. To undertake the journey without understanding the destination. [God help us embrace] the art of gentle revolution. And for the last time until Easter…..Alleluia! If you are discerning a call, this week’s readings are for you! And in a year when we are actively discerning our calling as a community, this morning’s scripture feels almost divinely delivered. We get a double dose in both of our readings from the Book of Isaiah in the Hebrew Bible, and from the Gospel according to Luke. Both are narratives of prophets and apostles answering God’s divine call. The former is the account of God’s call to the prophet Isaiah. A sort of atypical call, because in contrast to the calls to Moses and Jeremiah (both of whom immediately question the wisdom of God’s choice of them as prophets and mightily protest) Isaiah just volunteers himself for the position that God is looking to fill. God states the mission and asks “whom shall I send?” And up pops Isaiah’s hand; Isaiah is sort of the Arnold Horshack of prophets (you remember Welcome Back Kotter?) and so he says: “Here I am!” ….Oh, Oh pick me! And God does. Unlike most of the prophetic call narratives in our scripture, there is no coaxing or cajoling or convincing needed for Isaiah. He is in from the get-go! Likewise this morning’s Gospel reading is Luke’s version of Jesus’s call to his disciples is a different version from the call narrative recounted in the other two synoptic Gospels. In Mark and Matthew, Jesus is walking by the Sea of Gallilee, he sees a few guys fishing, he says, “follow me and I will make you fishers of people,” and they drop everything, immediately, and do as he says. Without question or qualm they leave their boats and their nets and their wives and their lives and follow Jesus as instructed to….God knows where. Luke however, tells it a bit differently. Luke combines the call of the disciples with a preview of the miraculous work that is in store for them. In Luke, Jesus does not call them to follow blindly. First, he performs a miracle by exponentially increasing the fishermans’ catch, beforehe suggests that they drop their previously empty nets to follow him. This is sort of the sister story to the post-resurrection story in John’s Gospel when the disciples encounter Jesus on the beach and catch more than they can possibly carry. In Luke’s version, the disciples witness Jesus’ power and glory before they make their commitment to drop everything and enlist. I say enlist rather than follow to emphasize Luke’s omission of Jesus’ command. The command to follow him. Because unlike Mark and Matthew, in Luke Jesus never verbally calls the disciples to follow. In Luke, following Jesus is just what they do. They hear the explicit call from a different place….like from the Holy Spirit that is written on their hearts. Maybe because they are already familiar with the power and promise of this miracle-maker. Jesus has already healed Peter’s mother-in-law. It is curious that Peter is so astonished at the size of the catch that Jesus delivers. But he has already seen the power of this rabbi in action. And so without prompting, the disciples drop their nets on the spot and go with Jesus leaving the enormous catch of fish, maybe the largest of their lives, on the beach. It would be tantamount to walking away from a winning lottery ticket. That is how strong was their internal call to follow. Luke’s story feels much more authentic to me than the similar versions in Mark and Matthew. The versions where Jesus says out loud, follow me. Maybe because I have spent eons of my own life waiting to hear God speak in such a clear voice. Waiting for God to tell me what to do. Where to go. And when. And I myself have never heard the words with my ears. But I have felt them in my gut. Clearly. Emphatically. Indubitably. I suspect that these fishermen who become the disciples of our Jesus, followed their gut, thusly. This is how it is done, says Luke in this passage. You take all of the information you have. All of the miracles you have witnessed. You trust your intuition about the leadership that you are folloing. And you listen to your gut. When it says follow this one, you have the courage to say yes. Even if you have to leave the largest catch of your life on the beach. Even if you have to leave the boat that you have spent your life building and repairing and relying upon. Even if you have no idea where the path might lead from here. Frederick Beuchner says that we know when we have met our true calling when our deep gladness meets the world’s deep hunger.– That is, when the work that we most need to do fits with what the world most needs to have done. There is no discerning a call in a vacuum. Any inward assessment of what we want to do or are meant to do or are needed to do must be matched with an assessment of what is wanted and needed in the world around us. Its not enough to want to fish for cod because we’re good at it and we already have our own boat. Because maybe the world needs us to fish for people and we will have to leave the boat on the beach. Both sides of the equasion must be honored. For Christians, the point of following any calling, the point of discipleship, is to join the transforming mission of God. And that means that we must be opento the transforming mission of God. As were the first disciples. I am guessing that following an itinerant rabbi had never entered their minds as a viable vocational option. Or at all. But when the door that had never been on their radar, never, opened, they were willing to walk through. They were the blueprint for the way of faithfully following a true calling. The disciples are our role models. Discipleship is our Christian goal. But I hardly ever feel like I am measuring up to those fishermen. And yet I don’t think that they followed because they were any better than the rest of us. They were not the crème de la crème of the faithful crop. They were not even Christians. They were fishermen. They did not follow because they were particularly good, or faithful or righteous….there is no mention of any of these things in this passage, or anywhere in the Bible, with regard to them, for that matter. I don’t think this is a story about how human beings can turn our lives to God if we only have the strength and the courage to blindly follow the call like Peter and John and James. The good news is that this story of discipleship is not a story about the power and capability of human beings at all…..it is a story about the power and capacity of God….a story about the way God works in us and in the world. For these fishermen had no reason to drop their lives and follow Jesus….no reason except the spirit of God that swept in and created an unquestionable faith where none had existed…..This is a story about the power of God’s grace, and God’s timing. About the way God creates disciples of Christ from fishers of cod in the blink of an eye. Immediatley. But in God’s time. And without a word. With only a feeling in one’s gut that the Spirit is ready. This passage is not a yardstick for our own faithfulness. It is an epiphany of hope….a reminder that God not only works in mysterious ways, but in powerful life changing ways as well. Albeit when God is readyt. A reminder that God’s call is always accompanied by God’s grace. The grace that has compelled countless apostles through the ages to abandon their personal catch of the day for nothing less than the struggle for wholesale peace and justice for all human beings. Some of them are among us now. Here in this sanctuary. The kind of grace to which our hearts must stay open if we are to be ready to respond to God’s call, immediately; if we are to take our personal places in God’s divine love story. Most of you know that I traveled to the holy land this summer on a JCRC clergy study tour. Every year the Jewish Community Relations Council of Greater Boston takes about a dozen Christian clergy to the holy land to better educate us about the exigencies of that religiously-charged segment of our wider world. It was a fabulous trip. Among many other amazing experience, a full week of walking in the footsteps of Jesus. From Nazareth to Jerusalem. On our Jesus tour, we started at the Church of the Annunciation in Nazareth. And from there to the Jordan river where Jesus was baptized and tourists can today baptize each other in the same muddy water. Then we stayed in a kibbutz on the Sea of Galillee called Nof Ginnosaur in Tberias. And before we left there for Tagbha to see the church of the loaves and fishes and then on to Capernum where there is the house of Peter’s mother-in-law, and then the mount of the beatitudes, we walked along the shore of the Sea of Galillee to a small museum simply called “The Boat Museum.” We almost skipped it. The day ahead was filled to the brim with Christian holy sites and time was tight. But for my two cents, the Boat Museum was among the most powerful moments of our trip. The whole museum wasn’t much bigger than this church. A café, a gift shop and the exhibit space which would have fit in this chancel. And the exhibit was simply the shell of the 1stcentury boat that was raised from the bottom of the lake in 1986, and is now supported in a stark metal frame in the middle of the room. The boat was discovered when drought caused the Sea of Galillee to recede enough for the hull to stick out of the water. The small vessel is 27 feet long, 7 and a half feet wide, and has the remnants of four oars. In the sparse carefully climate-controlled space there is also video showing the painstaking process by which the boat was raised and radiocarbon dated. It took several years. On another wall, there is a wall chart identifying the 10 different types of wood that were used in making and repairing the boat including cedar , sycamore, hawthorn, carob, laurel, willow, Aleppo pine, Judas tree, and couple more. Clearly this boat was well-used and repaired repeatedly. These fishermen took good care of their vessel. And finally, there was a large hanging display with this morning’s reading from Luke in English and in Hebrew. We were there first thing in the morning and so our small group of about 15 clergy were the only ones crowded into the small dark space around the cadaver of the ancient vessel. We stood there in utter silence – for this first time in the four days that we had traveled together no one uttered a word. Silence. But we could all feel it. The connection. The emotional connection. Not with Jesus. With the disciples. And maybe even just with the story of the disciples. We could feel ourselves in their shoes. In this rickety little boat. Listing under the weight of a catch that was far bigger than they could handle. On seas that might have been too rambunctious to safely navigate. This was the boat that had provided their livelihood and then been abandoned for their calling. There is no evidence that this is THE boat, other than the dating and the location of its discovery. But the tears on our cheeks were evidence enough of its authenticity. And I can only speak for myself, but I imagine that every one of us that morning felt called in a new way. Every one of us could hear the still small voice of God say, in the depth of our bowels: follow me. And it is going to cost you. I think the reason this experience was so powerful was that we were sharing the call stories of the disciples whom we hope to follow. Sharing our stories is a huge part of the process of healthy discernment, I think. And when that sharing is accompanied by a deep listening for the intersection of our hunger and worlds need, and very intentionally listening to what the Spirit is telling our gut, I have utter faith that we will each and all end up exactly where we need to be. Albeit, only when God is ready for us to be there. And so as we discern whatever call we are discerning, let us remind ourselves that we must walk without fret or fear forGod’s call is always accompanied by God’s grace. Freerick Buechner, Wishful Thinking: A Theological ABC, Harper & Row Publishers, 1973. Pp. 95.